We work with a variety of Sitecore implementations at Rackspace, and sometimes we need to do a surgical task without requiring customers to install anything in particular, trigger app pool recycles, or other changes to an environment. One such example came up today. Preferably, by using the dedicated Publish log set to INFO in Sitecore, one can get at a ton of handy publishing information . . . and this is our general recommendation for implementations (provided logs aren’t retained for so long that they cause a space concern on disk). In this case, however, the publish log wasn’t an option and so we had to get creative. --, Username as [Initiator] -- not for distribution! Here’s a glance of what the data might look like . . .
One key caveat to this SQL approach is that data in the Sitecore EventQueue doesn’t remain for long. Depending on how one tunes their Sitecore.Tasks.CleanupEventQueue agent, EventQueue records might be available for only a few hours. It’s certainly not a good source for long term publishing history! This is another reason why using the Sitecore Publishing log is really the way to go — but again, that text log isn’t available to us in this scenario. We ran the tests for an hour, then six hours, then at different times of the day . . . yet the results were consistent each time. The Standard S2 Tier was the recommendation based on our observed workload for every database (Core, Master, and Web databases). This implementation used MongoDB for session state, however, so this doesn’t include SQL Server session state into the calculation. There were usually around 9% of the time when the DTUs would spike and exceed the Standard S2 capacity, so I’m a bit concerned and curious about what that would translate into if we were running 100% in Azure (probably slow perf for those times — which roughly appeared to align with Sitecore publishing — which means the Standard S2 Tier might not really cut it). We could see Content Authors complaining of slow perf, stalled content updates, etc . . . so this is just a starting point. 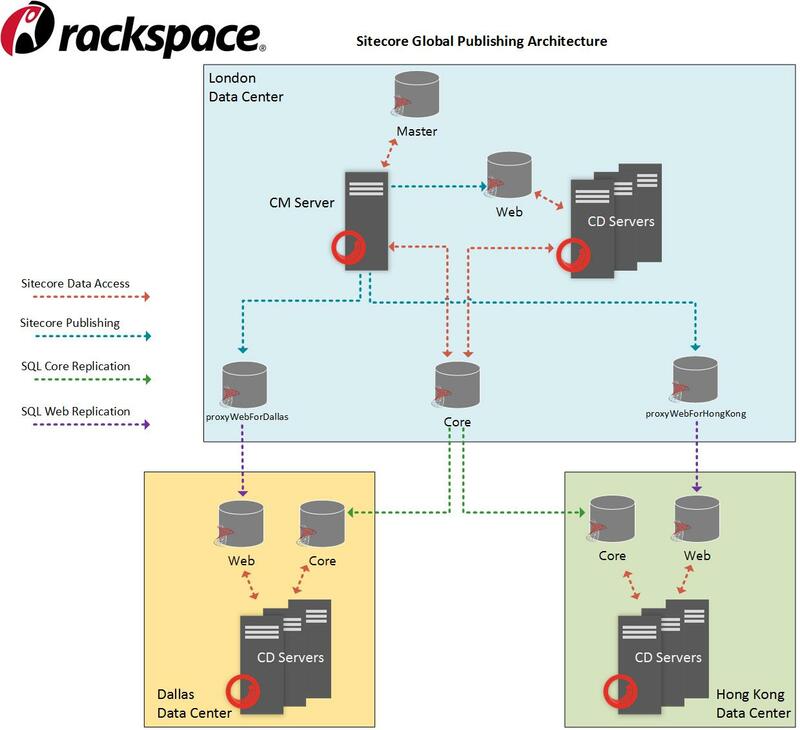 A couple months back, I shared our Rackspace publishing strategy for Sitecore in multiple data centers. It’s fast, reliable, and we’ve had good experiences taking that approach. That post at developer.Rackspace.com is only part of the picture, however, and I wanted to return to this topic since I recently had a chance to revisit our Sitecore configuration for a customer running Sitecore 7.2. Referring to the diagram above, we needed to patch the client Sitecore configuration to accommodate the addition of the proxyWebForHongKong and proxyWebForDallas databases; we were finishing up the provisioning of a clean environment, and had replication running, but we needed to connect the two remote data centers so they fully participated with publishing. Wading through the Sitecore documentation to find these key architectural pieces is tough, and you would need to synthesize at least the Search Scaling Guide, the Scaling Guide, and the Search and Indexing Guide to get to all this material. For my own benefit, probably more than for any potential reader, I’m consolidating this here. It’s important when one does a publish in Sitecore that it triggers index updates on the remote servers, as well as move the content to the appropriate Web database. This is the crux of what I’m up to here. To implement all of the above, we would typically steer customers to a Sitecore patch configuration strategy such as this one by Bryan “Flash” Furlong. For simplicity, however, we at Rackspace created a subdirectory App_Config/Include/Rackspace and placed a single config patch file in it. We don’t own the solution structure, and work to isolate our changes as much as possible from a customer implementation. So having a single file we can reference is handy for our use case — but not what I’d consider an absolute best practice. Here’s a nice summary on using subdirectories for Sitecore configurations, in case that’s new to you; here’s Sitecore’s official configuration patch documentation if you’d like to review that: https://sdn.sitecore.net/upload/sitecore6/60/include_file_patching_facilities_sc6orlater-usletter.pdf.